State-run, loss making telcos MTNL and BSNL got a relief as the Govt is weighing the option to refund Rs 12,846 cr to them as the duo don’t like to launch 4G/BWA services in some circles. The PSU duo got the spectrum in 2008 and paid the amount as per 2010 BWA auction price. Both the telco are making huge losses for last couple of years – BSNL Rs 24,681 crore and MTNL Rs 13,759 crore in 2012-13. However if the refund is calculated by pro-rata basis, as the spectrum was given in 2008, the refunded amount will be Rs 8,722.78 cr – Rs 5,204.98 crore to BSNL and Rs 3,517.80 crore to MTNL. The proposals seem to be good enough to be intial steps to make financial situation out of danger by Govt. Though there were talks to merge the companies, EGoM is looking for seperated network infra management company and land assest management company out of the two companies. 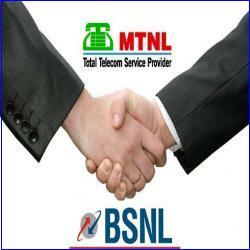 The main companies will be BSNL and MTNL who will offer services and marketing. And there will two more companies – which will account for handling telecom infra and technology business; and to manage & monetise land assests. First let BSNL bring 3G Pan India….. I think more than 50% loss can be avoided if all the BSNL employees ** WORK HONESTLY. Even in loss I think MTNL is providing good schemes in Mumbai and Delhi. Long live MTNL.